I am in need of a new 2TB HD and my primary concern is reliability. For many years the only drives I bought were the good old reliable and quiet Samsungs. 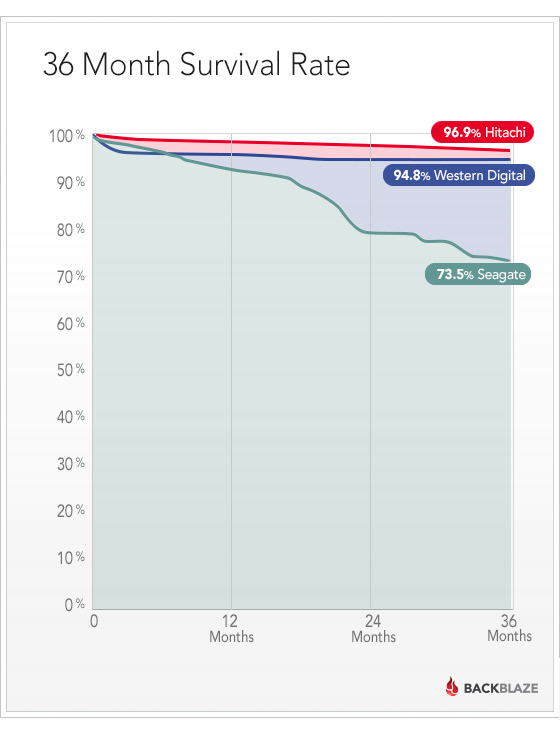 As most of you know, Backblaze released a HD reliability report based on their experience with thousands of Hitachi, Seagate and WD drives. In general the Hitachi units were best by far and the Seagates were terrible. WD was also not very good. I tried to verify Backblaze's results by checking Newegg customer reviews of some of the identical Hitachi, Seagate and WD drives. The newegg reviews were in the hundreds and they show terrible failure rates for all drives with WD being slightly more reliable than Hitachi or Seagate. A Hitachi drive that Backblaze reported an annual failure rate of less than 1% corresponded to a Newegg customer failure rate in excess of 50% based on a small sample size of 18 customers. I am left not knowing what to think. In case of WD it is mostly "DOA / dies in first 2 months, otherwise it works for long time". It is pretty much only Seagate which are sub-par. Customer reviews are usually a bad data source, as there are only two types of people writing reviews - superexcited ones writing positive reviews, and then the ones who had a major failure or DOA, with second group being more active. Customer reviews are by definition biased towards the bad end of the spectrum. and after all was said and done, what do they still buy a ton of??? The only thing holding Backblaze back from going with all Hitachi drives was the price, which was one reason why the company sticks with Seagate drives. There's another thread about Newegg and HDD customer reviews. The short version is: While Newegg customers might show high failure rates for a particular drive, Amazon customers don't. The leading theory is Amazon does a better job of protecting the HDD during shipping than NewEgg. So, it isn't the drive that's bad - it's the e-tailer. a lot of times its a misinformed e-user that rates a good product as bad. -buying a 2+tb drive for a system/OS that doesnt support it. or takes some hoop jumping to support it. That said, when there's a huge difference in customer feedback on the same item from two different vendors..
Also, the survey from Backblaze is about consumer drives that they stress in storage pods (warm, vibrating, running 24/7). maybe i will replace my nas drives with new seagates (thats whats in there now). my nas has raid, is backed up to an external disk as well, and also to the cloud, so im willing to roll the dice. hmmm the savings could almost buy me a nice dinner out with the GF... valentines dinner and extra lan storage? Win-Win! FYI, in November 2013 Newegg posted a youtube video touting their new shock-proof HD packaging so there may be fewer failures now. I guess I'll take a chance on a 2TB WD. Good find. Maybe in a quarter or two some industrious soul will compare Newegg's 2013 ratings/DOAs to 2014 ratings/DOAs. 2. Most people don't do any anti-static protection when installing drives. Bare drives need static protection until the PC case is closed. 3. I see a lot of bad reviews for green drives as either slow or doesn't work with RAID. That's they way they were designed, so I call all of those user error. Bare drives need static protection until the PC case is closed. IME it's sort of urban legend. I've several Seagate 2.5 drives running (Momentus 7200.4, Constellation.2, and others), and since last six years I've had no failures among them. Then you are lucky quest_for_silence, i had 2 of 3 Seagates in last 5 years die (1TB Barracuda LP 5900RPM and a 500GB in a Lenovo laptop). Sure, i had 7 of 8 WD20EARS die too - in same 5 year timeframe i had no WD10EADS (4), WD15EADS (4), WD20EARX* (6) or WD30EFRX (6) failures, at least not while i had the drives in my posession. * i RMA'd one as DOA, but i don't count that as death, but as a failed delivery as it was rectified within a week. Or else you have been unlucky, faugusztin, who knows? Considering the Backblaze experiences, i would vote for your luck . Considering your experience, if you allow me to misquote a saying of Oscar Wilde: - "To lose some Seagate may be regarded as a misfortune ... to lose both some Seagate and some WD seems like carelessness."! Definitely I think these jokes are pretty OT, so enjoy your WD Reds, faugusztin! It's rather unfortunate that Newegg reviews have been "Amazon-ed" and have become pretty much useless. In the old days a "hard drive" review was based on 1 model and 1 capacity on Newegg, so you could see if a certain size drive had more problems than others with say fewer platters. Not anymore, like Amazon, all are thrown into 1 big review pile, so if only the 4TB model poses problems you need to look at a lot of reviews before figuring that out, if you can figure it out at all. I no longer trust the cheap drives of any maker, but for Seagate to advertise 2400 power on hours (all of 100 days) I run away from such hard drives. 1. Most people don't post positive reviews, but for a bad drive most will post a bad review. Insufficient info here. The odds are 4 to 1 higher for a good HD not to get a review, but the bad reviews are often as high as 30%. And there's far too many that are DOA or dead just past the return date. If all you need a HD for is streaming this is fine, for critical backups this is ridiculous. You've looked at the specs of a desktop drive. All that it means is that they expect them to be used for that many hours per year. Most desktop drives would be used less than that. For 24/7 operation, they want you to use other drives which aren't necessarily expensive. I looked at a cheap Seagate I'm using: 27061 power on hours without a hitch. It's not in a desktop and since I'm easily manipulated into using the product designed for my application, I didn't use a desktop drive. for critical backups this is ridiculous. For critical backups, it's ridiculous to be relying on a single drive.